Can’t help posting this up when I saw who the illustrator of the Playstation Portable (PSP) game うたの☆プリンスさまっ♪ is… the mangaka for Togainu no Chi and Lamento illustrator/character designer, Kurahana Chinatsu-sensei! (倉花 千夏) Btw, it is not a BL game… rather an otome (girl adventure) game. I haven’t gone through the game’s official site in detail yet but the game features some of my favourite seiyuus, such as Miyano Mamoru, Suzumura Kenichi, Suwabe, Junichi, Taniyama Kishou (and minor casts? 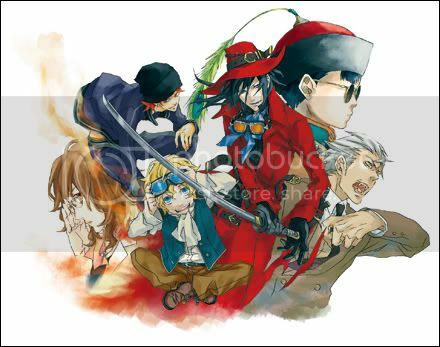 : Yusa Kouji, Toriumi Kousuke), etc and will be available in (probably mid) 2010. I don’t own a PSP but… this is another motivation to save for one now. *&^%$# I’m squatting in a corner like Ouran’s Tamaki emo-ing over this too. First off… please go check out Hatano Wataru’s new BLCD Oshigoto Kudasai! He plays a naive (but fortunately not idiotic) salaryman who works for an ex-Yakuza and his karami is…. OMG *dead from nosebleed* Even the other seiyuus commented in the freetalk that he is awesome lol~ and he was so embarassed. Kawaii! Subete wa Kono Yoru ni is one of my all time faves. It always makes me cry when I relisten to it *_* so amazing cos I already know what’s going to happen and yet I’m still moved to tears every time. It’s on my list of dramas to review too. Yeah… Yusa is our voice boyfriend lol~ XDD Oo~ I haven’t had time to listen to his latest work yet. ^^ Will keep that in mind. Never heard of the seiyuu voicing the uke before… :O I read that Kannou Mukashibanashi uses special 3D sound mixing or something… wanted to try it but got too busy hehe… okie goes back onto the list. Ah~ icic I went to the game website. I thought the character design style looked familiar! Checked the staff list… no wonder, by the artist who did Messiah XD Beautiful. Have you finished playing this game? I prefer Ishida in normal anime ^^ Generally I don’t like Ishida’s weepy ukes very much now that I’m more exposed to BL dramas… I think many of us began the BL drama journey with his works? I heard him once as a forceful uke (where he kinda raped the seme) that I thought he was pretty scary but cool lol~ (Oujisama Level BL game drama) So I think he actually sounds so much better as a stronger uke… like in Double Call but this series is so long I didn’t complete it. But, but when I bought Yusa's CD, when it reaches the wake-up call track, I actually goes into mushes hearing Yusa's わがまま, 子供っぽい voice! Then then on the jealously track… Oh my, I think pouty Yusa's voice is just <333 Most of the tracks he really uses his エロい voice so you can imagine how much blushings I did there XD Ahh~ seriously I can imagine why this CD still ranks so high in Amazon.jp among the CDs! It's just so… <33333 Even if I prefer Yusa's moans ~causeI'mapervert~ I'm still defeated by this drama CD since my M side really resurfaced lmao~ 3rd time re-listening already and still loving it to bits! Seikiichi felt like uke x uke XD but it was quite touching. I didn't understand why Suzuken's character's dad did that to Tachi-Shin's dad. I'm quite interested in their daddys' past lol~ Haven't listened to the other drama tho'. Messiah BL game? I haven't played it… awesome looking CGs!! Tachi-Shin has very similar vocal range as Kamiyan. I think he just needs that breakthrough role. Kamiyan is immortalised in my heart, thanks to his Fuyuki in Seikan-ji series. Thanks for the encouragement (^///^) and glad you delurked and commented! XD I’ve become a lot more selective about reviews I write and now tend to want to write more about the ones I really enjoyed. I would love to try some otome games cos the seiyuu cast are usually pretty impressive. Time is a factor tho. *_* Maybe investing in a PSP is a good thing? Cos they’re releasing more of these otome games for PSP… maybe can play while travelling to work or something lol~ Tachi-Shin has a lovely lovely voice ^^ Have you listened to his recent BL work Futashika na Silhouette 不確かなシルエット? (The seme is Morikawa Toshiyuki) He was beautiful in it. Gaa~ do post more! As you draw more, your skill and confidence will get better! Looking forward to them! i’ll keep the anime in mind. like you i am busy too OTL i didnt even watch anything to this seasons new releases. i am also using halfadders guide to play through the whole lucky dog game.Usually i only use it when i need help with a characters cg event. I like guessing the choices but i know im going to be even more busier soon so i want to finish before then.i realise that this year went by so fast! its almost over…. 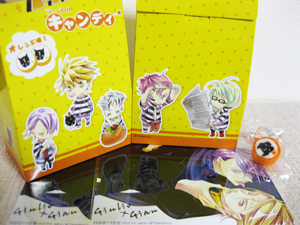 i saw on someones blog that it comes with mini postcard(?) cute! Yeah… I cut down on a lot of anime too. I was tempted to get Lucky Dog drama but I’m too broke *_* (YOu can find them at the forum already) I also shelved Hanakage to my wish-list. No $$$ after getting the Maiden Rose DVDs DX Time went by too fast… so many things haven’t accomplish yet. ZOMG they’re so EVIL! You can only get those calendars if you subscribe to the magazine, right? I ended up missing some important stuff because of it. ;_; i don’t dare touch that button anymore i use the enter key now if its something i already seen. Lucky dog is hard; they have so many choices. HAHAHA… XD you’re so right about Jiro!!! Ultra cool and cute. Love his little vampire teeth XD Did you watch the anime? Yep~ Gulio’s voice is really sweet! Like a little boy ^^ he is especially so when he is with Gian. I didn’t finish any character route yet… only got to the point after they escaped but I did get a couple of bad endings while inside the prison XP This game is quite long too so I think you’ll be occupied for some time indeed. it bothers me how much Kurahana and inugata seem so alike but not. I went to her site yesterday an there was a artwork which looked like from the game (that are vocaloid;) not sure. Psp is not bad. i got one for my bday but… i havn’t used it sense. XD; (no games expect guitar hero sadly) i wonder if U.S version can play Jp games?